Seventy-three and still kicking up a rock 'n' roll storm, When I'm President finds Hunter in fine fettle. 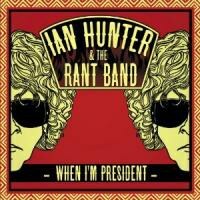 After mellowing out to a previously-unheard degree on 2009’s Man Overboard -- especially on that album’s B-side – Ian Hunter sounds more vital than he has in a half-decade on When I’m President. While the British-born Hunter is ineligible for duty (to say nothing of being, at 73, a little long in the tooth) his vision for a better country and wish for happier citizens remains as pointed as ever, with he and the Rant Band in fine fettle. Like Parker, Hunter has a sweet side too (one that I was firmly castigated for for not recognizing fully in the Man Overboard review). He laments over how his woman’s eyes turn from blue to green to red to sad to black (“That’s some kind of power you got,” Hunter notes) on the appropriately stormy piano ballad “Black Tears”; and celebrates a no-frills gal on the big-hearted hoedown “Just the Way You Look Tonight”. Dude totally nails the chest-swell feeling you get you when see your loved one gleam in just the right light. The upbeat closer “Life”, despite being the closing track on a 73-year-old man’s 20th album, is far more zephyrous than portentous: “Easy come, easy go / just another rock ‘n’ roll show / hope you had a great night... laugh because it’s only life”. Hunter’s far from done, and has plenty of rant left in him.